VANCOUVER — Police in Vancouver and other Clark County cities met this week to announce the kick-off of a $60,000 grant designed to reduce the area’s high rate of pedestrian fatalities. Funded by the Washington Traffic Safety Commission, the new Pedestrian Safety Zone Project grant will help put extra police officers on the road to enforce speed limits and educate drivers, pedestrians and bicyclists on their respective rules of the road. Vancouver and Clark County both have higher-than-average rates of pedestrian fatalities. In fact, according to the Vancouver Police Department, from the years 2010 to 2014, Vancouver was second only to the city of Seattle — a city more than four times the size of Vancouver — when it came to pedestrian deaths in Washington state. Compared to Tacoma, a city with similar population numbers, Vancouver’s pedestrian death rate is nearly 80 percent greater. This year has been a dangerous year for Clark County pedestrians. In March, an off-duty firefighter was struck and killed by a car while walking in the 500 block of Northeast 112th Avenue in Vancouver. 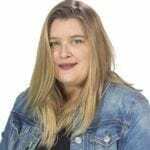 In mid-July, a pedestrian said to be jogging on Interstate 5 at night was struck and killed by a motorist near the Mill Plain Boulevard exit. And just last month, a 13-year-old girl reportedly attempting to cross Northeast 82nd Avenue in the 28900 block in Battle Ground, was struck and killed by a motorist. The new pedestrian safety grant, which will add officers to high-traffic areas throughout Clark County, is part of the state’s 16-year-old Target Zero project, which aims to eliminate traffic deaths and serious traffic-related injuries in Washington state by the year 2030. To continue the decline toward zero traffic fatalities in Washington, Inslee said the state needed to implement new strategies and focus on areas that were not seeing the same declining trend in fatalities. One such area? The number of pedestrian deaths in the state. According to the Target Zero report released in 2013, pedestrian fatalities in Washington were, “despite numerous engineering improvements and other strategies,” actually rising instead of dropping toward zero. 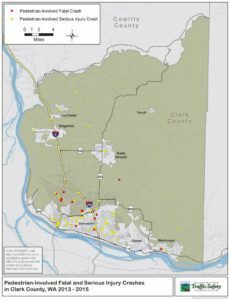 According to Safe Kids Clark County, a group led by Clark County Public Health that works with parents and caregivers to prevent childhood injuries, there have been 611 pedestrian deaths in Washington state over the past eight years and the majority of these deaths — 500 out of 611 — happened while the pedestrian was in the roadway. Two-thirds of the pedestrians killed were walking at night and 455 of the deaths occurred on two-lane roads. One of the most telling facts included in the Safe Kids’ data is that only one percent of the pedestrian deaths were caused by motorists traveling at 25 miles per hour (mph) or less. 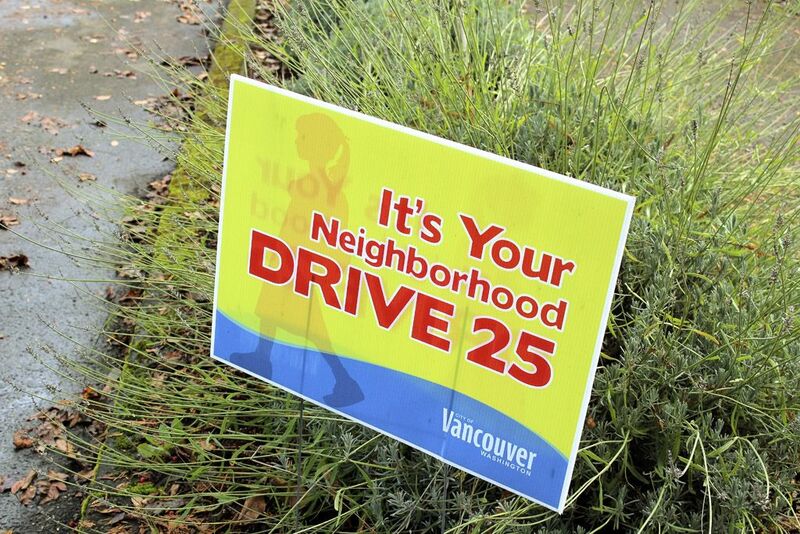 Reducing speed limits is something that Vancouver leaders have already been discussing. During a recent presentation on the city’s historic Evergreen Highway, Vancouver Senior Planner Jennifer Campos told city councilors that increased speeds are linked to increased risks of death for pedestrians and bicyclists. A pedestrian who is hit by a car traveling 40 miles per hour or faster has a 95 percent chance of dying. But take that speed down to 24 miles per hour or less and the numbers are reversed — now the pedestrian has an 85 to 90 percent chance of survival. Reducing speeds on city residential roads is another aspect of the state’s Target Zero project. In Seattle, city leaders are discussing a plan to bring the speed limits down from 25 miles per hour (mph) to 20 mph on residential streets and from 30 mph to 25 mph on main streets in the city center. The plan mimics what other major U.S. cities have already done in an effort to reduce traffic fatalities and make city roads safer for pedestrians and bicyclists. In New York City, for example, after city leaders implemented a 25 mph speed limit on city streets and 20 mph limit on residential streets, they noted a 30-percent reduction in the number of traffic-related injuries the following year. Don’t walk while distracted by a cell phone or other device. Use crosswalk, sidewalk and traffic control device when they are available. Wear a helmet and reflective gear. In Vancouver, a group of citizen volunteers on the city’s Neighborhood Traffic Safety Alliance provide options for neighborhood groups seeking solutions to area traffic problems and can help neighborhoods set up radar speed trailers, install yard signs and work together to help calm traffic in a particular area. In 2016, the city allocated $170,000 for Vancouver’s Neighborhood Traffic Calming Program, which offers both visual traffic calming elements like signage and road striping as well as physical traffic calming devices such as curb extensions and pedestrian refuge islands. The Clark Communities Bicycle and Pedestrian Advisory Committee advises local and regional governments on how they might improve bicycle and pedestrian safety throughout the Clark County area. The group meets from 6 to 8 p.m. on the fourth Thursday of the month at the Center for Community Health, Conference Room 210 C, 1601 E. Fourth Plain Blvd., Vancouver. Bike Clark County is a group that promotes cycling in Clark County and advocates for bicycle access, safety and education for adults and children in the area. Feet First is a nonprofit that advocates for more walkable, pedestrian friendly communities across Washington State.